My new oscilloscope seems to be reading DC voltages very wrong. Connecting it to a rasperry pi's voltage rail (which is usually spot on 3.3v) gives a reading of about 4.5v: The probes are adjusted correctly (the 1kHz square wave has flat tops and bottoms, but is 5.6v rather than the rated 5v). 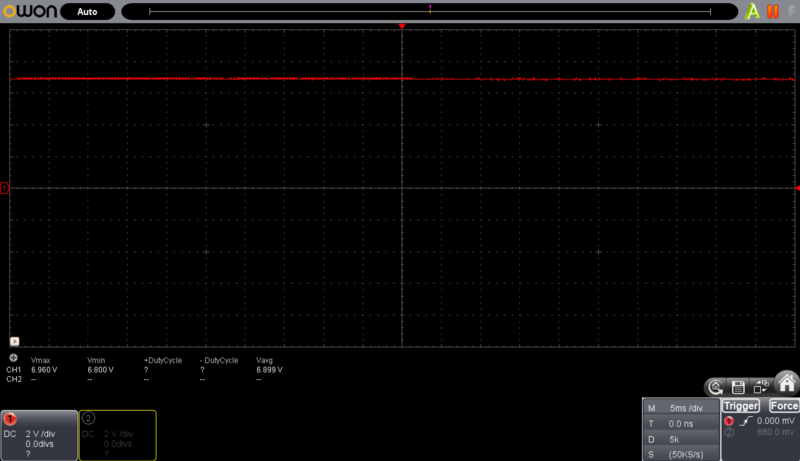 Testing a battery pack, measured with a multimeter to be 5.1v, gives 6.9v: I have no idea what's going on! The self calibration makes little to no difference, and there doesn't seem to be an option for manual calibration. I had the same thing Voltage was reading 40-50% high. Solution:- use dedicated USB supply ( was sharing with phone ). I assume the USB was not supplying a clean 5V, so the OWON was struggling with a low or dirty power supply. Running perfectly now within the +/-3% now. Before you test the oscilloscope on an unknown voltage, you should test it on a known voltage. Lucky for you there is a port that generates a 3.3V square wave on the unit itself. On point 4 in the pic below is where you should attach the probe. You should see a 1kHz square wave with 3.3V amplitude. If you don't see the 3.3V square wave then the unit is probably broken. If you do see the square wave, then you need to worry about your setup and where your ground is while measuring. The scope has USB for it's ground so depending on what is upstream this could be affecting the voltage reading or creating a ground loop. Oscilloscope for troubleshooting higher voltages? 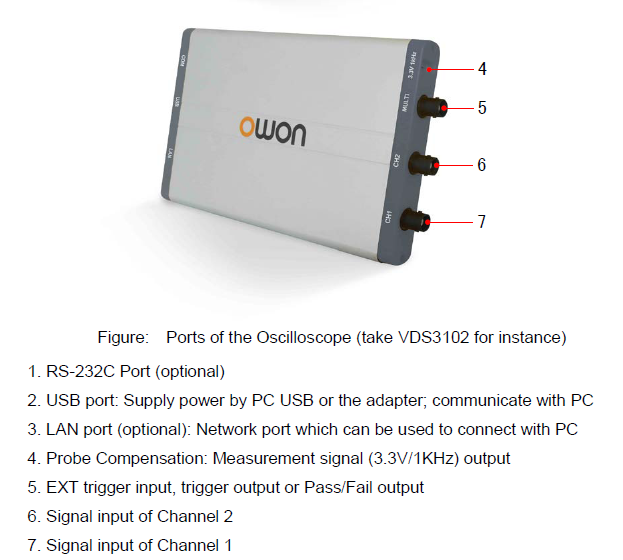 What's the difference between USB and non USB oscilloscope?